Are you a fan of Asian culture? Do you want to have a memorable item that reminds you of special occasions? Are you looking for the perfect Asian-themed gift? Then an Asian style bobblehead is definitely the right choice for you. From different Japanese-themed clothing to your face on Bruce Lee, below are the 11 best bobbleheads that are crafted in the Asian style. A bobblehead body is often overlooked since the emphasis is always on the enlarged head – hence the name bobbleHEAD. 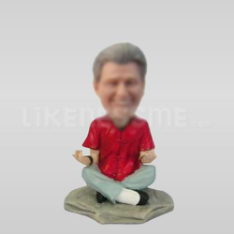 But this bobblehead comes in the form of a Buddhist. The body of this bobblehead is crafted in such a way, that it portrays a Buddhist sitting down. It’s a really interesting figurine since not many bobbleheads have bodies that represent an action or movement such as sitting down. Most of them are standing up. Click here to look at this awesome bobblehead. 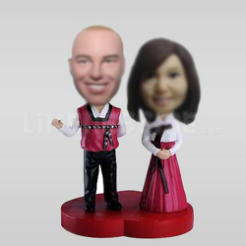 This bobblehead represents an Asian style bride and groom. 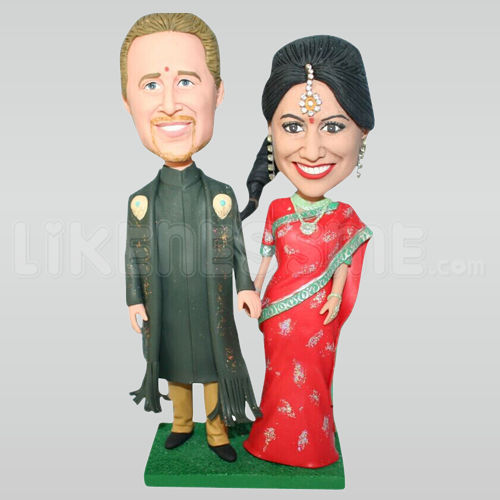 A perfect gift for the newlyweds, this figurine can be customized with any face and any look. This one, however, has quite a beautiful play of colors. The groom wears a long gown which is dark green. The bride, on the other hand, wears a beautiful red dress. Peace and Tranquility! Another bobblehead different from others is the one of a man in meditation. It has the usual look of meditation where the person sits cross-legged and resting the arms. It’s the perfect gift for the person who loves to meditate and find inner peace and happiness. Have you ever thought that you could have your face on your idol’s body? Well, there is a chance that you can have your very own face on the body of Bruce Lee. With the legendary yellow jumpsuit trademark, you can be as awesome as Bruce Lee was. It’s a great gift for any martial arts fan or any martial artist. Don’t know what to get a couple as their wedding gift? Why not get them a customized bobblehead that reminds them of their special day? If they had a Chinese style wedding, then this is the perfect gift for them. The bobblehead has two people: the bride and the groom. Both are dressed in traditional Chinese attire in red. You can even use this bobblehead as a cake topper. This is a bobblehead perfect for any fan of Asian culture. You don’t necessarily have to be Japanese to have this bobblehead though. It’s perfect for anyone who loves the Japanese sense of style. 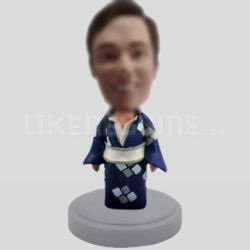 This bobblehead features a man in common Japanese clothing. This bobblehead features a person wearing a purple kimono with light purple and light blue diamonds. It’s a perfect gift for the admirer of the Japanese kimono. You can customize this figurine to have any face. It’s a perfect gift for any occasion: for birthdays, holidays and special celebrations. 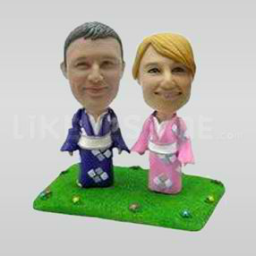 Similar to the bobblehead above, this one features a couple in the traditional Japanese kimono attire. This particular bobblehead features the man in a purple kimono, whereas the woman wears a light pink kimono. Both beautifully combined. 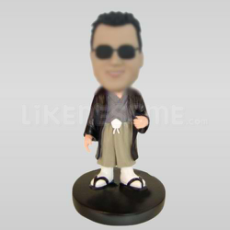 You can customize the bobblehead to fit any Asian style clothing that you like. This is another bobblehead for couples which is slightly different than the one previously mentioned. 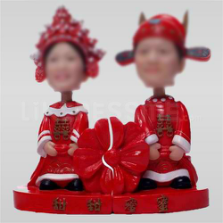 Still, in the Asian style clothing theme, this bobblehead features a couple in Korean clothing. 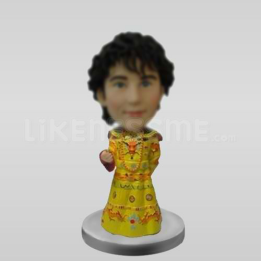 Both figurines can be customized with any face and any type of clothing that you may wish. A perfect gift for a special occasion. Have you ever wanted to be in the shoes of an emperor? Well, this figurine will allow you to transform into a different character. Your face can be on the body of an emperor. What makes this bobblehead so awesome is its sense of style. It wears a yellow garment which is decorated with beautiful ornaments. And last but certainly not the least, this Asian themed clothing figurine is pretty cool. It is also a representative of Asian culture. 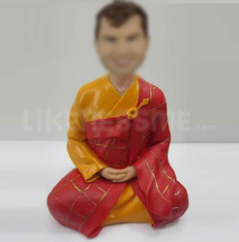 This bobblehead features a person in a long red kimono holding a fan. 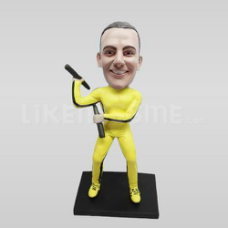 You can even customize this bobblehead to represent any type of clothing. All of the above bobbleheads can be customized to fit your needs. Any face and any style can be applicable to the figurines. Get your friends, family or significant other a custom Asian style bobblehead that’s perfect for any occasion. They’re even a great gift just to say that you appreciate them. All you have to do is send a picture of your face. You can also send a picture of the costume you would want on the bobblehead. 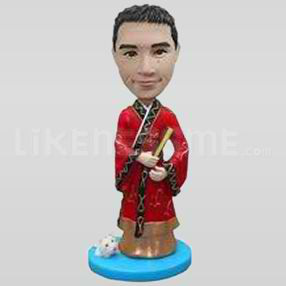 And voila, you have your very own Asian style bobblehead. This entry was posted in Custom bobbleheads on July 7, 2017 by winter.